Thanksgiving is just days away, and Christmas is just around the corner. That means it's time to pull out all those family recipes, but sometimes it's fun to introduce a new recipe or two. This year, I want to get back to something I love, pumpkin. Not just the pumpkin spice that everyone obsesses over this time of year, but pumpkin itself. So here are some of my favorite pumpkin recipes. Some make great side dishes, and some work well as meat-free main dishes. These recipes also don't have to be confined to this time of year, sometimes I make these just for fun. So I hope you enjoy! 1. This makes an excellent replacement for stuffed turkey. Stuffed pumpkin can be served year round and is a great, healthy dish. This recipe is Vegan and Gluten Free. Feel free to experiment with fillings. Try quinoa or rice instead of bread, add cheese to the mix, or try using seasonal produce from your local farmer's market. Preheat your oven to 350. Line a baking sheet with parchment paper. Cut away the cap of the pumpkin and scoop out the seeds and stringy bits (save the seeds to toast later if you want). Clean up the underside of the cap. Season the inside of the pumpkin (and the cap) with salt, pepper, and cayenne. Place on baking sheet and set aside. Pour olive oil in a skillet over medium heat. Add the onions and mushrooms. Cook until onions are slightly browned. Add in the spinach (or chard) and cook until slightly wilted. Scrape mixture into a bowl and add the bread, garlic, apple, chives, thyme, and sage. Mix well. Stir in the cashew milk and season with salt & pepper, to taste. Stuff the mixture into the pumpkin, cover it with the cap and bake in the oven. Bake, covered, for 1 ½ hours (90 minutes). In the last 30 minutes of cooking, remove the cap to allow any extra liquid to cook off. Transfer the pumpkin to your serving platter, carefully. To serve, either scoop out the stuffing and pumpkin flesh, or slice into the pumpkin. 2. This vegan, gluten free, chili is great for the colder nights that accompany this time of year, but it's also packed full of healthy produce and spices. This recipe works well with zucchini, turnip, yellow squash, celeriac, and many other vegetables. Feel free to play around with it and try some new ideas. Peel the pumpkin and cut into 1-inch pieces. In a 6-quart or larger pot, heat the olive oil and whisk in the flour and ground flaxseed. Whisk until smooth, and add in the pumpkin, turnip, zucchini, peppers, onion, garlic, and tomato paste. Cook about 10 minutes, stirring frequently. Add in remaining ingredients (including the juices from the can of tomatoes). Bring to a boil. Reduce heat and simmer at least 1 hour (longer if you have the time). Season with salt and pepper to taste. Enjoy! 3. These are not your typical pancakes. Packed with savory vegetables, they can be served for breakfast, or as a side dish at dinner. Make sure your veggies are thinly shredded or finely chopped when you make this vegan, gluten free, recipe. Feel free to play around with the ingredients. Try golden beets instead of carrots. Or use Parsley, Sage, and Thyme instead of Cilantro, Turmeric, and Cayenne. Instead of Spinach, use Watercress or Swiss Chard. The possibilities are endless. In a bowl, combine all ingredients (except oil). Mix well, adding more soda water if the batter is too thick. Heat and grease a griddle or skillet. For each pancake, use 2 tbsp batter. Spoon batter onto hot griddle and allow to cook. When the bottom is done, carefully flip each pancake over to finish cooking. Each side takes about 3-6 minutes to cook until lightly golden. Serve hot. These taste amazing when topped with sour cream, feta or goat cheese, toasted pumpkin seeds, a variety of chutneys, and many other toppings. Enjoy! 4. This falafel variation is so good it'll be hard to go back to the regular kind. It's great for a Thanksgiving meat alternative, or for a quick lunch. The dressing is a delicious hybrid of the traditional Tzatziki and Tahini sauces you typically find at flalfel restaurants. Feel free to play with the ingredients a little and make it your own. Preheat your oven to 350. Coat a baking sheet with olive oil. Place the onion, garlic, and chickpeas in a food processor and pulse a few times to break everything up. Add in 1 tbsp olive oil and the remaining ingredients and pulse until a coarse paste forms. Don't process this too well or it won't work. Form the mixture into small balls (or use a small, 2 tsp, cookie scoop), or patties. Mixture will be soft, be careful and use wet hands to avoid sticking. Arrange falafel on the greased cookie sheet and brush with olive oil. Bake for about 35 minutes, turning once or twice to ensure even browning. Whisk together tahini, yogurt, and lemon juice. Slowly stir in remaining ingredients. 5. Mashed potatoes are a staple with many a meal here in the South. This mash combines the potatoes with pumpkin and seasonings to provide an excellent twist to for our Holiday tables. And just like mashed potatoes, you don't have to limit this to the Holidays if you don't want to. Put the potatoes in a large pot and cover with water. Bring to a boil. Lower heat to medium-low and cook for 20 minutes, or until potatoes are easily mashed with a fork. Drain water. In a small sauce pan, heat 1 tbsp olive oil and saute the garlic until golden. Mash potatoes until smooth, mix in all other ingredients and adjust seasoning if needed. 6. I love making my own salad dressings. It's a great way to add a touch of healthy herbs, ferments, and/or flavor to any diet. Here's one of my favorite fall dressings. 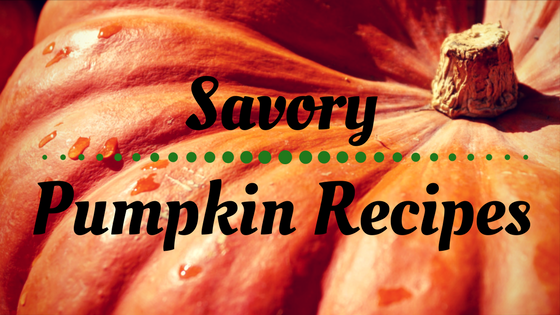 Feel free to play around with the ingredients to make your very own pumpkin dressing. Combine all ingredients in a large bowl. Whisk vigorously to combine. Enjoy on any of your favorite salads! I hope I have done my part to get you all interested in pumpkin, not the spice, this fall. I also hope I gave you some new ideas for Thanksgiving, or any Holiday, dinner! In any of these recipes, feel free to change the ingredients around. Have fun, play around, and let me know what you think below! I'm glad you enjoyed the recipes. Did you get to try any? Have any favorites?